Alpha Gamma Rho again has a strong leadership team. 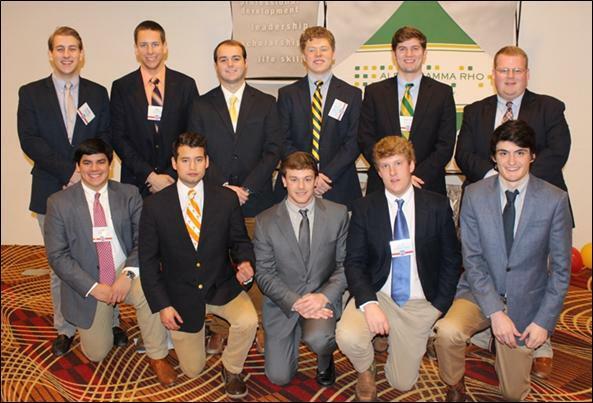 These eleven brothers have been providing chapter leadership in 2017. Pictured: top, left to right: Addison Jones, VNR Recruitment: Kyle McMullen, VNR Scholarship; Stephen Anderson, VNR Planning; Patrick Fagan, VNR Membership Development; Connor Fuqua, VNR Finance; Sam Daniel, VNR Alumni Relations. Bottom, left to right: Alex Vargas, VNR Kitchen Steward; Christian Cardona, VNR Activities; JR Clay, Noble Ruler; Jacob Harrison, VNR Management and Operations; Jordan Pruitt, VNR Risk Management.